There are definitely no snowflakes in this article. But there are a couple of losers who flunked Robbery 101. Blue Lives Matter reported that a Louisiana Liquor store owner casually confronted two armed robbers as if there was not a single fearful bone in her body. She was so calm, that even though she got shot in the leg, the robbers left without getting what they wanted. Of course, one of them got a bullet in his shoulder for his trouble. Siham Hassan is the owner of the First Stop Discount Liquor store in Cullen, Louisiana. At about 10:18 p.m. on November 5, two men from Hope, Arkansas tried to rob it. Guess they thought, woman – alone – easy target. Not so much. As he shoved the gun in her face again, and told his partner to go behind the counter and get the money, she still seemed undaunted. 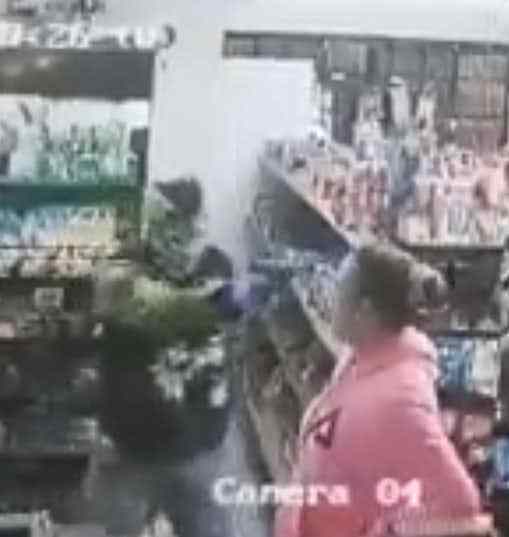 She calmly walked past the gunman, walked behind the counter and grabbed his partner and gave him a shove away. “I’ve got something for you,” she said. As she picked up her .45 handgun both men were running out the door. As she had her back turned, one shot her in the leg, but still calm, she hobbled after them and torched off at least 4 rounds. One of the men was shot in the shoulder. It is unclear whether the two men were found and arrested, but police have evidence left behind by the suspects. Siham Hassan has learned a great deal of self control to not be rattled by the robbery attempt. She was treated at the local hospital and is home and doing fine according to KTBS. Next articleCalifornia’s Wildfires Lend Fuel To “Climate Change” Hucksters, Yet, Miss The Real Targets: Fire Jihad + Environmental Extremists, Stupid!